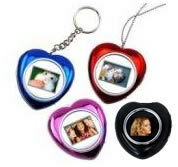 The Esquire Mini heart shaped digital photo frame is able to store up 74 photo. Simply upload your photos onto the device memory. Long lasting rechargeable battery built-in recharges from your computer USB.